The need that we fulfill is entirely local. From collection to processing and distribution, all of the blood donated remains in Kentucky – saving the lives of people in the Commonwealth. To facilitate simple and convenient blood donations, KBC has five donor centers. Monday – 8 a.m. to 6 p.m.
Wednesday – 10 a.m. to 7 p.m.
Thursday – 10 a.m. to 7 p.m.
Friday – 8 a.m. to 6 p.m.
Open Christmas Eve and New Year’s Eve 8 a.m. to 2 p.m.
Click here or call 800.775.2522 to make an appointment. Wednesday – 10 a.m. to 6 p.m.
We also have convenient mobile blood drives throughout the region. In addition to our donor centers, you can also donate blood at a local business, community group, school or church that hosts blood drives. Click here to search for a blood drive near you. The community leaders who arrange blood drives are responsible for nearly half of all of the blood that is distributed through KBC. This results in tens of thousands of units of blood every year, and is a vital component of our ability to fulfill the needs of local patients. If you would like to host a blood drive at your work, church or school learn more here. 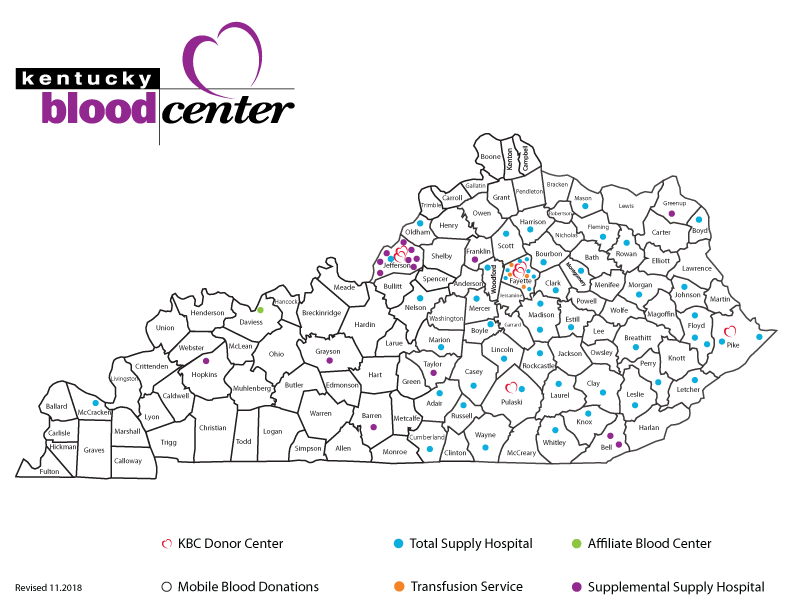 Right now, patients in Kentucky rely on the hard work of community leaders who host drives and on individual donors for the vital blood that they provide.